Unless you have been living under a very heavy rock you will know that Hearthstone have a druid issue. My colleague Zechs has already talked about this issue in spades. Let me start off by saying it should be no surprise that the meta is not in an ideal spot. We are in uncharted territory. The number of cards available in this standard rotation is greater than ever before. This is a number that will keep growing till it peaks at the last expansion next year, with a total of 6 full expansions in one rotation. Standard rotation was introduced when Hearthstone only had 5 expansions, half of them adventures with only 45 cards. There will be issues that slips past testing, and this will be recurring. With more options comes more options for degenerate imbalance. Rough times are natural for any CCG. Not a surprising change in the least. Druids uprising in the recent month has been through both aggro and midrange decks, all of which utilizes Innervate. With this change the plays from all of these decks will be way less explosive and the overall speed of druid will be greatly reduced. Easily the most overdue change. Something i told Blizzard needed to do back in February. It is unlikely this card will lose its deckslots though given that pirates relies heavely on weapons and besides a 3 mana 3/2 weapon is still a decent deal. But this card has been one of the most damaging cards for Hearthstone and i am happy to see it is finally getting nerfed. Another overdue change. I would have made it 5. While Shaman is not currently an issue in the meta, this universal removal card has proven to have way too much potential. A little surprising but not uncalled for. Persistent health gain are one of the most confusing mechenics in the game. It is so bad Blizzard has a permanent entry on the "Not a bug" post regarding these effects. Most of them like Blood imp were removed during the beta aswell. 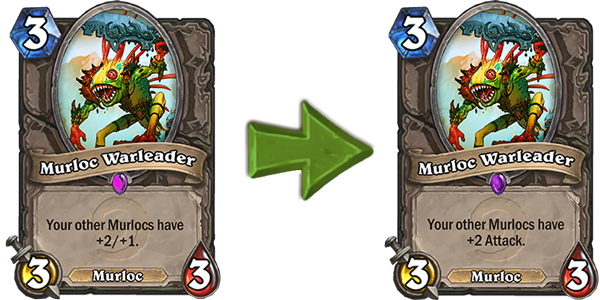 Warleader having this effect and being a power card in the meta, should make it very clear why this change occured. Spreading Plague: Now cost 6 mana. Tempo has been one of ramp druids historical weaknesses and druid being able to punish that, just turned out to be too much. With this change and the nerf to innervate it should once again be possible to race over ramp druids when all they do is generate more mana. I will say I am hesitant to think that these fixes alone will be enough to fix the meta. Druid is the most prominent deck right now but right below the surface lies Quest mage. A deck that in my opinion, is way more cancerous because its wincondition acts completely outside of minion play, as opposed to Jade druid that are just way too good at minion play. With recent support it has been known to go off with its infinite damage combo as soon as turn 8. Far before you could expect to break even a single Ice Block. This could leave the meta in just as bad a state as Quest mage shares many of the same problems as ramp druid. It forces people to go on the aggressive and is very punishing to control decks. Something that would leave us back to square one for the summer championships. Do you think these changes will be enough? Hell yea. It is about time. Nope, the meta will be bad still. Good balance to murloc paladin. Innervate - weird nerf, I feel like they rendered it useless, maybe it will work in miracle druid.